Daniel is a certified Level 3 personal trainer with over eight years of experience, having trained all over the world. He is also qualified in GP referrals, boxing, plyometrics, spin and has an Advanced Nutrition qualification. He specialises in fat loss, muscle gain and boxing. Daniel offers down to earth personal training that’s fun and is an expert in helping clients learn how to create specific meal plans to suit their personal tastes and lifestyle. He is also a regular nutrition and fitness contributor to national and international press including Fabulous (The Sun), Stylist Arabia, Buro 24/7, Ahlan and LovinDubai.com. 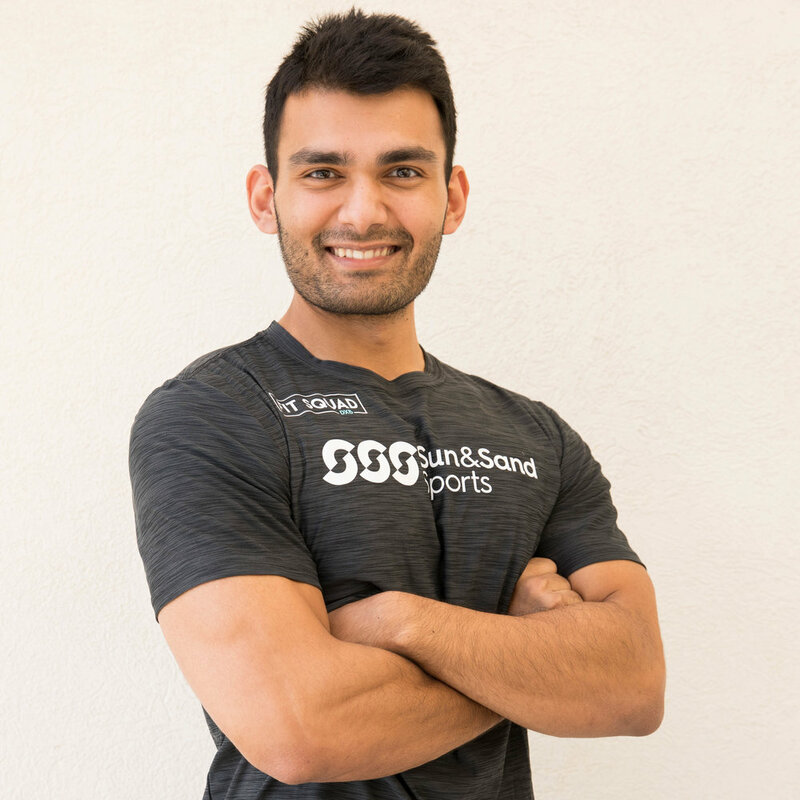 Devinder is a qualified Level 3 personal trainer and PN1 nutrition coach. She specialises in weight loss, strength training, HIIT, boxing, prenatal and postnatal training. She is also a qualified running coach and expert in endurance racing. Devinder is a former 'ultra' runner who has completed numerous regular and ultra marathons including the 150-mile Marathon Des Sables - known as the toughest race on earth. As a writer and editor, she has worked for everyone from Grazia, Women's Health and Stylist Arabia to The Sun, The Daily Star and The Telegraph, writing about health, fitness, travel and women’s issues. Alex is a qualified level 3 personal trainer specialising in muscle gain and fat loss through resistance training. He is also an expert in HIIT, circuits and strength training, all of which he executes in a fun and approachable manner. Alex provides nutritional advice that promotes a balanced lifestyle, as he believes balance is the key to being sustainable long term. He helps each of his clients assess their current eating habits and supports them to improve their diet through personalised nutritional guidelines. Alex believes in creating a partnership with his clients and working towards improving their lifestyle and creating healthy sustainable habits that they can adapt into their existing routines. He is a keen sportsman having played football to a high standard, he also enjoys playing golf and taking part in various charity events including the Three Peaks Challenge and London Marathon. Del is a Level 3 personal trainer and is also qualified in kettlebells, spin, circuit training and TRX. He is an expert in high intensity workouts, physique and advanced bodybuilding training as well as fat loss and nutrition. Derek has been boxing since a young age and is a specialist in pad work when training clients. With a background in football and a keen interest in golf and water sports Derek is a multi-faceted trainer who can cover a variety of training techniques to achieve optimum goals whether that's during one-on-one training or in group sessions. Kayleigh is a qualified Level 3 personal trainer and remedial massage therapist. She is also qualified in kettlebells, circuit training and nutrition and has a background in kickboxing, netball and athletics. She has used her knowledge and expertise to train and treat people all over the world, from the UK and Australia to Bali and now Dubai. Kayleigh specialises in fat loss, strength training, HIIT, circuits, boxing, functional movement and is a highly motivated individual who is passionate about what she does. Her ethos is to teach her clients to live the best life, nourishing the body through the right nutrition, correct personalised training methods and treating/healing your body naturally through massage. As an IBS sufferer, she is a strong believer in living a healthy, active and balanced lifestyle. Jamie is a certified level 3 personal trainer who specialises in body fat reduction, weight loss, muscle mass building and postural analysis as well as muscle tone and development. He is an expert in strength and conditioning, HIIT, CrossFit and boxing – having practiced boxing for over two years and MMA for over a year. Jamie possesses excellent communication and relationship-building skills and is able to a build rapport with clients on all levels, effectively encouraging and motivating everyone he trains. As a self-motivated and dedicated personal trainer, Jamie’s goal is to provide an elite service, with all training sessions and nutritional advice tailored to the individual. Errol is a qualified Level 3 personal trainer who is also certified in Functional Movement Training, TRX, Kettlebell and KO8 training. He specialises in weight and lifestyle management, strength and conditioning, corrective exercise, bodybuilding and fitness physique. Errol is also an expert in lower back pain, trigger point, high blood pressure and osteoporosis as well as nutrition. His focus is on continual life-long learning and working towards enhancing the wellbeing of his clients by empowering them with knowledge, skills, support and guidance to assist them on their journey to a healthier life. Sophie is a professionally trained dancer from London Studio Centre with a BA (Hons) degree in professional dance and has performed internationally for brands such as Adidas, Reebok, Nike, PUMA, Bloomingdales, Mercedes, Austin Martin, the London Olympic Closing Ceremony 2012, on cruise ships and much more. She is a qualified Pilates Level 3 instructor and has launched her own Pilates / Yoga inspired fitness workouts on SUP boards called Super SUP Fit with features in Sun & Sand Sports, Savoir Flair, The Bikini Society and a mention in Womens Health. She has a keen drive for fitness and correct alignment but most importantly having fun and feeling good. Rob is a certified Level 3 personal trainer with over five years of experience coaching in London, Melbourne and Dubai. With a sports science background he uses a scientific approach to ensure maximum client results. Rob specialises in full body transformations helping his clients lose body fat and gain muscle. Strength training and Crossfit style circuits are his areas of expertise. He offers high level one to one coaching as well as small group coaching. Also a qualified TRX and kettlebell coach he can teach you beginner to advanced training techniques, as well as boxing and pad work. Rob uses his advanced nutrition qualification to advise you on how to correctly eat to achieve any desired goal. Gaby is a Level 3 qualified personal trainer specialising in functional training, fat loss, and toning. She combines strength training, circuits, kettlebells and many other types of training to ensure her clients achieve their goals. She is an experienced boxing coach who is qualified in Boxercise and Advanced Pad Work. Gaby understands how important good flexibility and mobility are for her clients so she finishes sessions with expert stretching work. She also offers advanced nutritional advice to help her clients live a healthy lifestyle. Farooque is a Certified Level 3 Personal Trainer with over eight years of health and wellness experience in both Canada and the UAE. He specialises in strength and circuit training, TRX, boxing and plyometrics. Throughout his career he has helped hundreds of clients through their fitness journey from dropping body fat to training for marathons. His education and experience helps him understand his clients anatomical limitations and he has successfully helped clients push past their physical and mental barriers. Every session with him is an exciting experience, unique and responsive to each of his client’s short-term and long-term goals. Ben is a qualified Level 3 Personal Trainer, Power Athlete Level 1 Strength and Conditioning Coach, Crossfit Level 1 with a 15 year professional sport background in high level yacht racing. He specializes in weight loss and toning through building a base level of strength for his clients. Ben has been a specialist in delivering results for his clients all his life and your fitness journey will be no different. Ben works with his clients to make sure that their diet and nutrition are dialed in to achieve their goals in the fastest possible time. He loves to regularly check in to make sure that they are keeping to their part of the bargain! Katie is a certified Level 3 personal trainer specialising in strength training, muscle building, fat loss, HIIT, circuit training and boxing pad work. She is also a qualified sports coach, teaching football, basketball, hockey, netball, volleyball, tennis, badminton and skiing to youths. She offers one-to-one sessions as well as group training. Katie has always had a passion for health and fitness and enjoys helping others make the necessary changes to achieve their goals and lead a healthier lifestyle. She offers well-planned training and nutrition programmes, tailored to each individual client and their needs, with a wide range of advice on exercise, nutrition and supplements..
Mark is a level 3 personal trainer with qualifications in exercise referral, circuit training and indoor cycling. He has a keen interest in safe and effective weight loss and is an expert in muscle gain and strength training. Having competed at national level in athletics as a teenager, Mark completely quit exercise in his early twenties, taking four years to regain his passion for sport and exercise. It has provided him with an acute understanding of the varying levels and attitudes that people can have towards training, along with an insight into different fitness goals. Mark also has experience in managing injuries as well as rehabilitation requirements having recently returned to rugby after having knee reconstruction surgery in 2017. Mark is an all-rounder with a positive attitude that can get anyone excited about working out. Zuzana is a Level 3 certified trainer, TRX trainer and an Advanced Sports & Exercise nutritional advisor. She specialises in fat loss, sports nutrition, health coaching and preventive health. Zuzana has experience in prenatal and postnatal training, circuits and endurance training – she is a competitive ultra runner and triathlete. She is passionate about working with clients who want to lose weight and those who want to overcome emotional eating, hormonal imbalances and sugar cravings to find their own health balance. Zuzana is also highly knowledgeable when it comes to advice on vegan, juice and raw eating plans. Jacques is a certified Level 3 personal trainer with over four years of experience in the fitness industry, he offers down-to-earth, one-on-one sessions and fun group exercise training. He specialises in nutrition, sport-related injuries, post surgery therapy, weight loss, muscle gain and strength and conditioning. He has been involved in a variety of different sports, including water sports, tennis, rugby, cricket and five years of MMA (professional level), he also has national colours in gymnastics. Jacques’ key focus is on technique during individual, compound and complex exercises to ensure full muscle contraction and range of motion. Faris is a certified level 3 personal trainer, specialising in strength training, body building and circuit training. He is well versed in nutrition, supplementation and diet plans. With an extensive experience in fitness, Faris has trained individuals of all ages, from teens to seniors, non-gym goers to competitive body builders. With a background in corporate team building, he is able to keep motivation levels high with creative and sporadic workouts. He is lively and passionate and adapts his workouts to make them both enjoyable and challenging. Marius is a certified Level 3 personal trainer with over eight years of experience, coaching in Tokyo, London, Bucharest and now Dubai. Marius is a certified Black Belt in Judo, Jiu-Jitsu and also in Brazilian Jiu-Jitsu, and he has competed in many cage matches utilising these disciplines. Strength training, CrossFit, and circuits; using high intensity kick-boxing and MMA style techniques are his sessions of choice. With a varied sporting background he uses his experience and knowledge to ensure maximum client results. Marius assists his clients (adults or children) to lose body fat or gain muscle but he also enjoys teaching self-defence strategies and techniques. Marius is not just a personal trainer and mixed martial artist with good results in competition, he also has experience working as security in Tokyo and London for VIP clients and celebrities. Suki is a qualified holistic life coach, meditation teacher and Reiki practitioner. She is certified by the UK College of Holistic Training, and gained her Level II Reiki qualification during training with an Indian Reiki master in the Himalayas. As well as offering one-to-one services, Suki heads up Fit Squad DXB’s Corporate Wellness and comes to the role with over a decade of experience working for multinational corporations, most recently LinkedIn, both in London and Dubai. She is an expert in team building, employee retention, work/life balance, emotional intelligence and raising personal brand.